Gotta catch ‘em all—unregistered voters, that is. Photo courtesy Naysa Mooney. Hillary Clinton’s on-the-ground campaigners in Ohio are using a novel tactic to find potential voters: Pokémon Go. 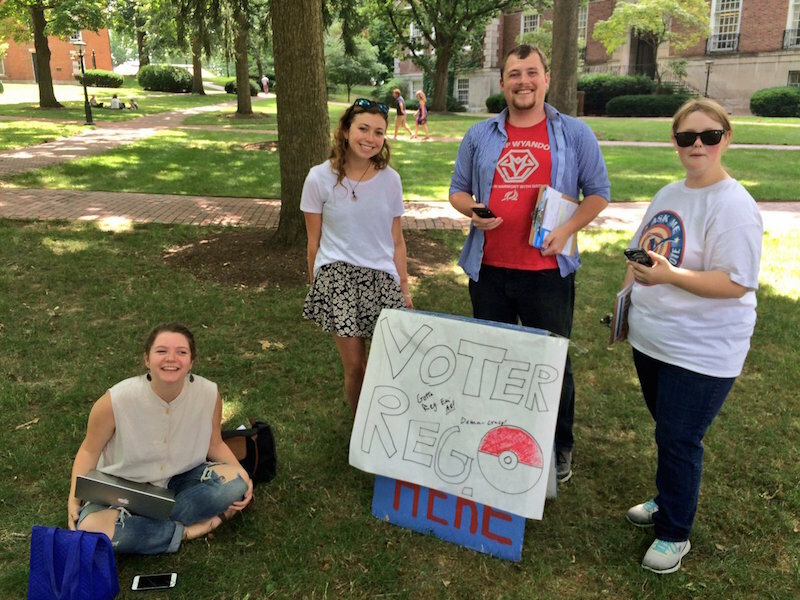 “Reg ‘em all” was the group’s slogan as voter registration canvassers set lures next to PokéStops and waited for potential voters to come to them. The digital lures attract Pokémon in the game, and PokéStops are real locations, such as murals, statues, buildings, and benches in parks, where players can collect supplies and catch Pokémon. As the lures draw Pokémon, players follow—and then the canvassers can ask if they’re registered to vote. The Cincinnati Enquirer reported that Clinton’s Ohio campaigners were out all weekend, from Lakewood to Akron to Athens. “Pokémon Go is the best thing ever to happen to voter registration!! Already got 3 people!” tweeted Ohio Democrats Fellow Naysa Mooney. Clinton’s site posted an event for Lakewood, Ohio last Saturday calling for people to meet them at a PokéStop in Madison Park. “[We’ll] put up a lure module, get free pokemon, & battle each other,” the event page states. A PokéStop and voter registration hub in Athens, Ohio. Photo courtesy Jennifer Friedmann. Clinton’s campaign team hasn’t mentioned using this tactic beyond Ohio. With the positive press she’s received, it’s hard to imagine her stop using Pikachu and Squirtle as campaigners. More people are finally taking notice of the abuse. But there’s still a dearth of discussion on why it’s happening.